Atotal of 55 soldiers have been deployed to Kadavu. The Commander of the Re­public of Fiji Military Forces, Rear Admiral Viliame Nau­poto said the deployment included Surveyors, signals, some from 3FIR and the En­gineers. He said the majority of the team was from the RFMF En­gineers Corps. Rear Admiral Naupoto said one senior military officer was part of the assessment team that flew to Kadavu by helicopter on Fruday. “I was supposed to go, but I gave my seat to Major Lepani Damuni,” he said. The team deployed to Ka­davu left on Friday night on board the Lomaiviti Princess I. 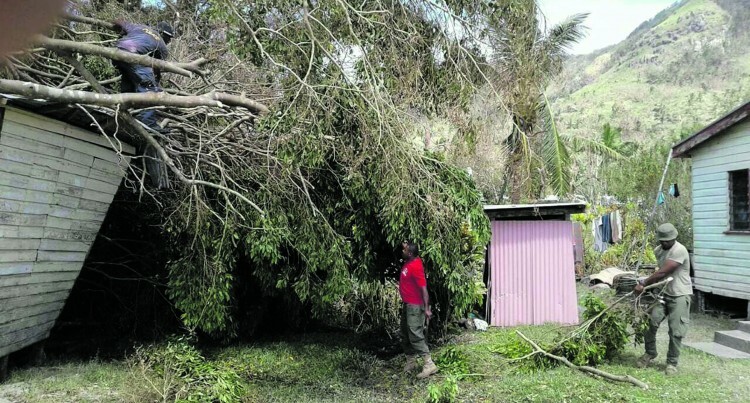 Meanwhile, the RFMF Engi­neers Corps operations offic­er Major Sanaila Vitukalulu said the Engineers will be divided into clean-up groups to help villagers. Yesterday he went with the Engineers Commanding Of­ficer (CO) Lieutenant Colonel Semi Mocelutu to check their men helping in the clean-up in the Western Division. He said they would also visit the engineers group working in the Northern Division and Kadavu. Meanwhile, the Vunisea Jet­ty approach washed out dur­ing Tropical Cyclone Keni has been repaired by the Fiji Roads Authority (FRA) and was operational from Friday, April 13th. This was part of a brief­ing by the director National Disaster Management Office (NDMO), Isireli Leweniqila. On the initial damage as­sessment at Kadavu, he said, 43 homes were completely damaged and 179 partly dam­aged.